Hamas calls for open war after news surfaces that Sa'ad Dawabshe dies from his wounds in arson attack. Sa'ad Dawabshe, the father of the infant who was killed in an arson attack on the Palestinian village of Duma last month, has died in Soroka Medical Center in Be'er Sheva. He suffered burns on 80 percent of his body and was sedated and on a respirator. Dawabshe was taken from the hospital in a hearse at 12:00 without special fanfare or an official announcement. Dawabshe's wife, Riham, is suffering from burns on 90% of her body and is being treated at Sheba Medical Center in Tel HaShomer. Their son Ahmad, 4, is also being treated there and is in serious condition; he has been improving and was disconnected from a ventilator on Friday. In response to news of Sa'ad's death, Hamas spokesman Husam Badran called for open warfare against Israel. 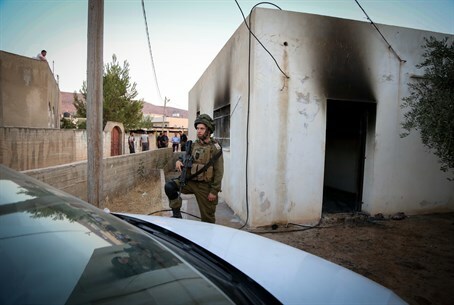 "Nothing will stop these murderous settler attacks and... we cannot wait until they come into our villages and our homes," he said in a statement. "There is no alternative for our people in the West Bank [Judea and Samaria - ed.] but to launch a comprehensive war against the Occupation."